Last week the IOC said individual sports' governing bodies must decide if Russian competitors are clean amid claims of state-sponsored doping. But it now says the newly convened panel "will decide whether to accept or reject that final proposal". The World Anti-Doping Agency (Wada) had recommended all Russian athletes be banned after its independently commissioned report found evidence of a four-year "doping programme" across the "vast majority" of Olympic sports. The 800m runner's testimony helped shed light on the scale of doping in Russian sport, and she was to compete under a neutral flag in Rio. In a letter to the IOC on Saturday, Stepanova and her husband Vitaly asked the body to "reassess the decision on Yulia". 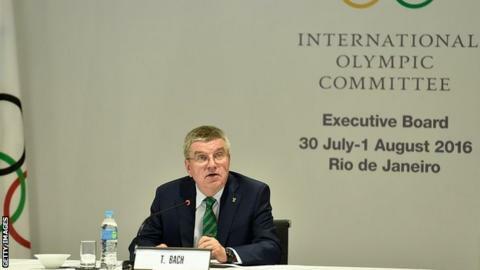 "The final decision has been taken already," IOC spokesman Mark Adams said.